1. Why does ACE show all the data? ACE is designed as a development environment, and observational data is crucial in developing the theory. Therefore we do not want to place any restrictions on how you want to view the data. If you want to find the calibration dataset of any nuclide which has an age closest to 7.2 ka, ACE should be able to help you. However it does mean that the Sample Browser can get very cluttered with unnecessary information. The purposes of the Filter Editor and View Editor are to configure the Sample Browser to show whatever you want. We encourage you to use these, they are surprisingly powerful tools. 2. Why can’t I interactively change sample values? 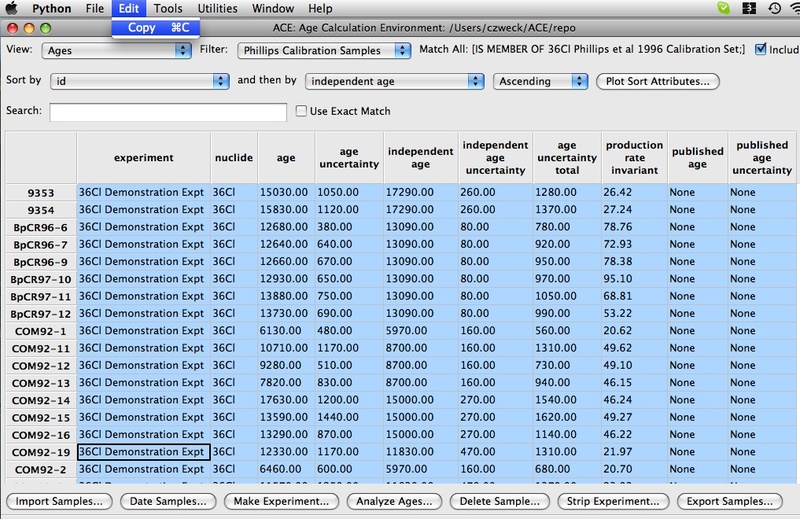 ACE is designed to examine the sensitivity of sample ages to cosmogenic nuclide theory. By being able to interactively change sample values, this is effectively deleting the original and not exploring sensitivity but drifting towards new results. As this violates the whole purpose of ACE, we have disallowed it. If you wish to explore the sensitivity of your sample to certain attributes you are not sure of, we recommend that in the original CSV files you duplicate some rows and change the attributes in the newly created rows. Then import that file and proceed. In this way you can explore the sensitivity by comparing new vs old values and make some plots of the results. Most importantly you wont lose track of your original sample parameters. All that being said, we might change this if enough people complain. 3. What is my repo? This is useful as if you are collaborating with colleagues and you wish to show them some results, just send them your repo. ACE allows switching between repos, so you can also have multiple, separate projects. 4. Why a 10 year default timestep? The timestepping routine in ACE starts at the present day and works backwards in time, and ACE will calculate the age of a sample as the age when the modelled inventory becomes negative. For a large timestep, this can become unprecise. However as there are no collection data supplied with ACE with smaller than a 100 yr temporal resolution, we recommend that for speed you adopt a 100 yr timestep, and then when you want precision better than this go to a 10 yr timestep. 5. Why a thickness of 1E-5 for samples? Many authors report cosmogenic inventories that have already been scaled to include the effect of the sample thickness. Some don’t. As these thickness values are therefore often not reported in the literature, we feel it is best to input cosmogenic inventory as already accounted for sample thickness. Therefore for these samples we eliminate the scaling factor due to sample thickness by making the sample infinitessimally small. We are open to changing this procedure in the future, and have already included the optional attribute measured inventory as a temporary place to store uncorrected sample inventories. 6. What is the copy menu option for? 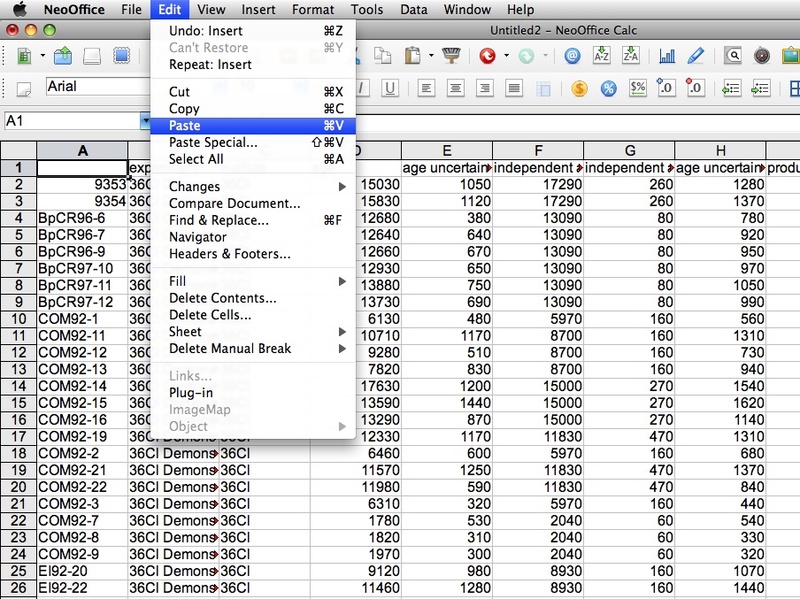 Most software programs have a copy/paste utility, in ACE the copy utility allows you to export your highlighted data to other software programs. For instance if you have made an experiment, and want to show the details of that experiment to a colleague, you can select the experiment details in the Experiment Editor, click ‘copy’ from the menu options, and paste into an email. The data will be pasted as tab separated values. This utility also works for data collections and experiments so that visualisation and tables can be made quickly. For sample details outputted in csv format, it is probably easier to use the View and Filter options to select the types of samples and sample details that you want, then export as a file using the Export Samples button. The copy utility is really designed for fast information transfer and analysis. 7. I keep getting the error message ‘entry ‘repodir’ appears more than once in group ‘/windows’ ‘. ACE uses a preference file in ~Library/Preferences on a mac and ??? on a PC call ‘ACE Preferences’. It keeps track of things like your default view options, window sizes, and which repo you are currently using. 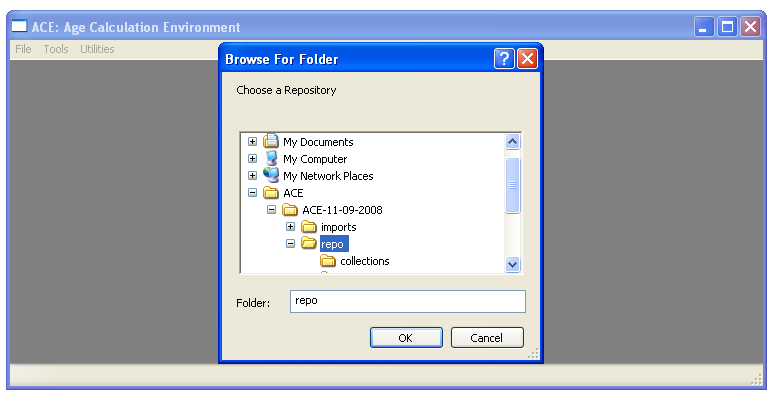 The above error message means that multiple repos are listed in this file and ACE is not sure which one to use. The easiest thing to do (if you don’t mind losing some non-crucial settings is to shutdown ACE, delete this file, and restart. Your window positions will look unfamiliar, but they will be saved when you next quit. 8. Why for time invariant experiments and stable nuclides is the time invariant production rate different to the time averaged production rate? This is a timestep issue. For stable nuclides, time invariant production rate is the ratio of cosmogenic inventory to calculated age. However, as ACE assigns a sample age as age when modelled inventory becomes negative, the modelled age overestimates the apparent age by a timestep. For small timesteps this overestimation is small, but it can be large for large timesteps, with large differences between average and time invariant production rates as a result. To check this, you should always find that the time invariant production rate is less than the time averaged production rate, as the denominator (apparent age) is larger than it should be. 9. When will the next version of ACE come out? ACE is a development environment, which means that different people will use (and develop) it for different reasons. This means that ACE will evolve into something that we don’t even know about yet. For this reason we are not sure whether to update and release ACE as point versions (1.0, 1.1, 2.0) or have ACE modules which can be uploaded onto the ACE website and enhance the functionality of ACE as it is now. 10. Why doesn’t ACE have feature X? Because you (or we) haven’t built it yet. Please let us know what you would like, or begin a discussion below about how you would like ACE to operate differently. 11. So … what values should I use? Sorry, not our job. We have listed our ‘preferred’ set of experimental choices in the default experiments supplied with ACE, but we don’t want to tell you what to do. Read the literature, or even easier run ACE using the different choices and see how much your sample ages vary. If it is not a big change, the choices are probably not so important. If it is a big change, you probably need to investigate. Also each experiment has a calibration reduced Chi-Square, which quantifies the discrepancy between the independent ages of your calibration dataset and the ages calculated by your experiment. A small Chi-Square means good agreement, and large Chi-Square means poor agreement. If you think the calibration set you are using is accurate, then experimental choices which minimize Chi-Square could be seen as more realistic choices. 12. I click ‘Plot Sort Attributes’ and no picture shows up. What happened? Generally this means that in the sample browser there is no sample that has values for both of the attributes you wish to plot. Try looking through these columns to make sure some of your samples actually have values for this attribute. Most likely this means that you have selected which nuclide you want for the experiment. Go to the ‘Nuclide‘ panel in the experiment editor and choose a nuclide from the drop-down menu.